You know, back in the day when a song played at the beginning of each episode? Some had words, others were just melodic, but they seem to be disappearing. Now you mostly just have a 3-second splash of the logo perhaps with a guitar riff, etc. Below I have listed my top 10 most memorable TV theme songs from Childhood. Now, you should note that when I say "most memorable" I don't mean "best show." Far from it, actually, these are just songs that stuck in my head and I liked. I know, I know, this probably seems like a very weird show to put on any top-whatever list; it was a hoky show that was (at best) mediocre animation. However, for whatever reason I easily remembered the theme even to this day, and I kind of liked it. Perhaps it was just the complete and utter fantasty nature of it -- pure escapism: "Trolls, and witches, and fairy kings (?? ), birds that talk and fish that sing." I really don't have all that many memories of the show itself, but the theme is an undeniable classic. As a kid, who wouldn't want to go on the kind of adventures that Tom Selleck experienced once per week? He had access to fast cars, boats, helicopters, cool sunglasses, etc. Not to mention an awesome moustache. Of course the fact that this was a pep-band song in high school helped, too. Like Magnum, P.I., here is a show where I have very few memories of the show itself, but enough to know that I thought it was awesome. As I recall, it was basically about a rogue seudo-government agent with a helicopter who went around doing good in a general sense. The awesome airborne helicopter combat sequences made it for me at the age of 5-7 or so. I have gone back and watched some clips of the show on YouTube, and in retrospect it was pure 80's hokum. The theme, however, with it's synthesized flugelhorn goodness, stands the test of time. 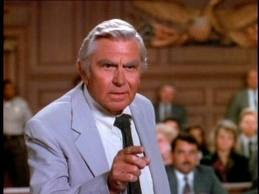 Although Andy Griffith holds heroic status in the mind of many "mature citizens" in his Matlock role, I didn't really care for the show itself. The theme song, however, was pure genius. I often remember watching the theme song and then changing the channel. If I ever became a lawyer, I would want them to play this song every time I entered the courtroom. 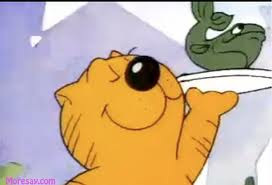 Heathcliff: the generic equivalent of Garfield. The show was about a feisty housecat and his misadventures in his neighborhood. Also featured were the alleycats - a rag tag band of 5 (?) cats led by a cat named Riff-Raff who lived in a junkyard. The show was OK, but the theme was very memorable: partly for the tune, but even more so for the words. Me and Johnny never dare." And always have an alibi." 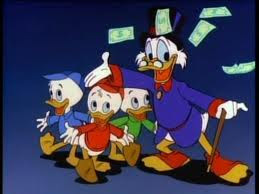 If push came to shove, I would say that Ducktales was my favorite cartoon of all time. The theme was very memorable too. When I was quite young, I had a Knight Rider Big Wheel. It was the bomb, needless to say. For this reason and others, I thought the show was cool. Also, at some point we (my family) saw the Knight Rider car, KITT. (Whether of not it was the "actual" car, I don't know, but it looked the part, and had the unique red running light across the front bumper. I also remember it had a cord - plugged into an outlet. I think this was at the State Fair or something.) I think most of us can easily get the song stuck in our heads. It was a very memorable song, and deserves third place status. Not only are the cities mysterious, for a long time in my mind the show itself was mysterious. 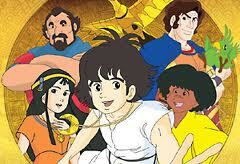 I always had a memory that as a child I saw a show about cities of gold. In my mind, I was 7, 8, or 9 roughly. I remember there was an anime type show (before any of us knew what anime was) about three children whom ran around South America looking for lost cities while being constantly chased by dumb villains. Along the way, they used a giant solar-powered flying bird and a solar-powered ship. It was only on for one season. It was one of very few shows I remembered that had an actual "end" to it -- eventually they find one of the cities. Until the rise of YouTube, Wikipedia, etc., I wasn't even sure that my memory was true. Did this show really exist? The only reassurance I had was that one time my friend Brian Jackson told me that he remembered the same thing on Nickelodeon. Memories flooded back in a bizarre and slightly emotional "It's real!" type way. That theme is both haunting and epic. I dare you to find anything that good in the last 15 years. I'm very anxious to get the set on DVD, once it becomes halfway affordable. 1st vs. 2nd place was a VERY close call. But . . .
M.A.S.K. - which stands for Mobile Armored Strike Kommand (yes, "Kommand" with a "K" - I suppose M.A.S.C. wouldn't hold the same ring) - was a T.V. show created for the sole purpose of selling toys. It was basically a show that took good elements from other shows like G.I. Joe and Transformers. Remember above how I mentioned that I tended to like shows that had a lot of named characters? Well, this one not only had a lot of named characters but also had a lot of named vehicles: vehicles that transformed into ... [wait for it...] a different vehicle. A jeep turns into a boat, a motorcycle turns into a helicopter, a helicopter turns into an airplane, a car turns into a flying car, a truck turns into a more awesome truck with guns, etc. Working overtime; fighting crime - fighting crime! Who will neutralize as soon as they arrive (at the site). And Spectrum's got the supervision! Always riding hot on Venom's trail. Honorable Mention: Look these up on your own. Please share your memories along with me!